I've been watching Once Upon a Time, and its directly influencing my outfits lately. This green vest was my favorite item of the swap because it reminds me of something Snow White may have worn while thieving in the forest. The unseasonably warm weather made it possible to break out my shorts which kind of pushed the outfit into lederhosen territory, but that's ok! I borrowed my mom's beautiful pin with the bell from Cortina in the Italian Alps, I added the red bird brooch too for contrast on the green. Its going to be hard to part with the vest because it is something I would buy for myself in a heartbeat and wear once a week. 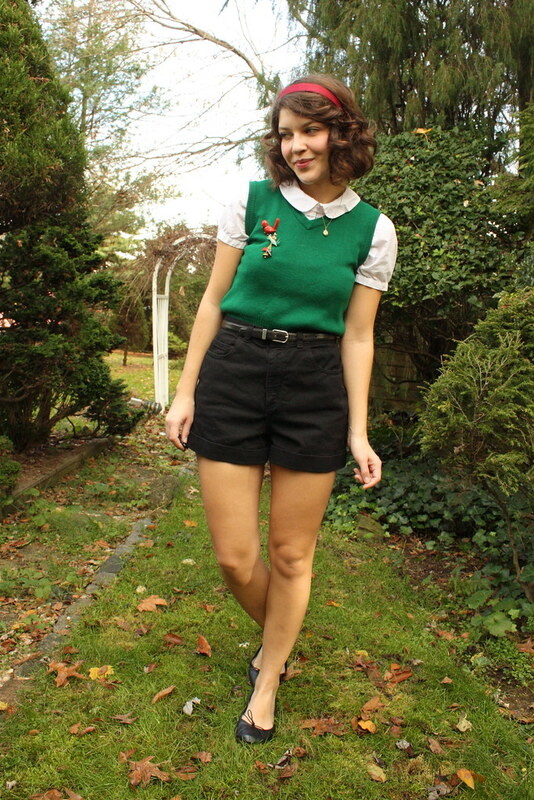 Here's how Lily of Love Charles Vintage styled the vest. *Post title from Snow White and the Seven Dwarves "With a Smile and a Song"
I love the green vest! I can't wait to get it in the swap so I can style it up as well. It does remind me a little of Snow White in all of the right ways. Beautiful! once upon a time is my new favorite show! love it! and i love this outfit! I'll mail it back to you when everyones done if you wanna keep it! It fits you perfectly, after all. I've never seen Once Upon A Time but it sounds as though I may have to check it out. I love the way you've worn the vest, such a cute outfit. It's so interesting to see how the other bloggers have styled it as well. ohmygoooooosssshhhh I would keel over from happiness. i just love these swap posts! theyre so fun! love the vest with the white collar! Looks like you get to keep the vest! Meanwhile, I can't believe you're wearing shorts with bare legs still... the weather must be crazy over there! INSANE! I wear tights to work because I feel like I have to, but seriously its 65F just about everyday. This is so pretty! I really like the addition of the pins - too cute! my goodness you look adorable in this outfit. 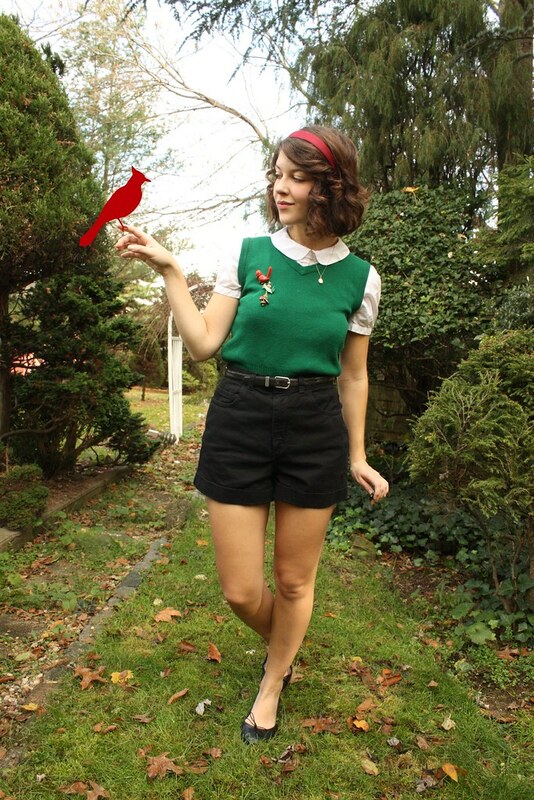 The bird pin add the perfect touch of whimsy. Stop by & enter my giveaway! That vest is perfect on you! I love the colour very much! Sweet pin, too. I am very jealous of your shorts. It rained all day here and it was miserable. I adore your pin!!! the vest with the white top is beautiful!! This outfit is definitely something I would wear. 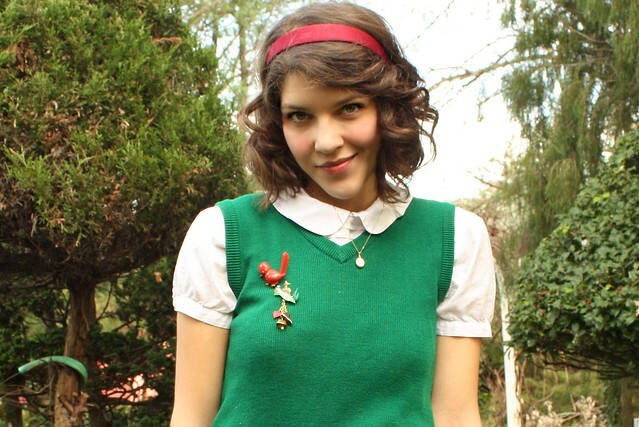 I love how you styled the sweater vest over the cute collared shirt. The shorts look great with everything too.